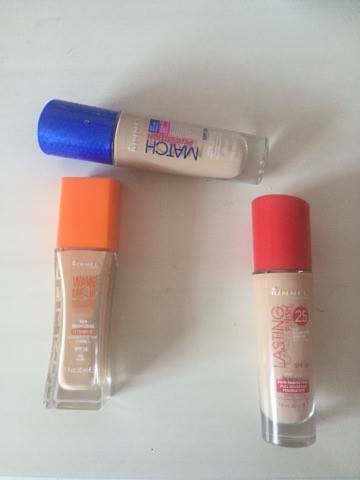 Testing out Rimmel London foundations!!! This is a great foundation and personally I love this foundation for when my skin isnt really feeling it's best. It is sold in superdrug for £7.99. Which i think is a great price for the amount of coverage. This foundation reminds me a lot of the Mac studio fix fluid foundation which is sold for £22.00. I love using this as an alternative so that I can keep my more expensive foundations for other occasions other than college. I love that this foundation and all of the foundations from Rimmel smell nice too. it always makes it better when wearing it. The coverage is really good and I would say that it is better for more oily skin. I mean it says it is illuminating but i don't find that it is. I find that this is my favourite foundation because it was so nice on the skin and gave my skin a nice glow. I found that this foundation did last long just not really on my nose area. This foundation is also £7.99. This is a great dupe for the Benefit oxygen wow foundation and is way more affordable than it is too. I love this foundation as it doesn't cling to any drier parts of the skin. Which is great. This foundation is amazing. I like that is gives me a really natural coverage. I prefer to use this foundation when my skin is at its best because the coverage is quite light to medium. this foundation is £8.99 in superdrug. Which is quite good value for money. I feel like Rimmel london just nail foundations. They seem to get them spot on and I also really like that these foundations are in glass bottles and all come with pumps. I think this foundation is a good dupe for the Nars sheer glow foundation as it is illuminating with quite a sheer coverage that is buildable if necessary. I hope you enjoyed this blog. If you did then please feel free to like it and share it with others. Also make sure you are following my social media.